BACKSTROM’s title character is in hot water. 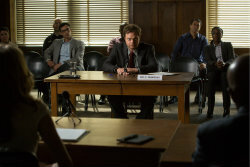 While viewers know that Backstrom shot a suspect (and himself) in the show’s pilot, his claim that it was a justified shooting — and that Visser shot him — is being investigated by the Civilian Oversight Committee…led by Backstrom’s ex-fiancee, Amy (Sarah Chalke). When the two go head-to-head in this exclusive clip from Thursday’s episode, “I Am A Bird Now,” Backstrom, originally, tries to get out of the situation by going over his police statement — which Amy rebuffs — and then he attempts sarcasm. But when Amy emphasizes how serious this could be, Backstrom’s already questionable health takes a turn.